Labour leader Jeremy Corbyn has said the UK government should not extradite Julian Assange to the US, where he faces a computer hacking charge. The Wikileaks co-founder was arrested for a separate charge at Ecuador’s London embassy on Thursday, where he had been granted asylum since 2012. Mr Corbyn said Assange should not be extradited “for exposing evidence of atrocities in Iraq and Afghanistan”. 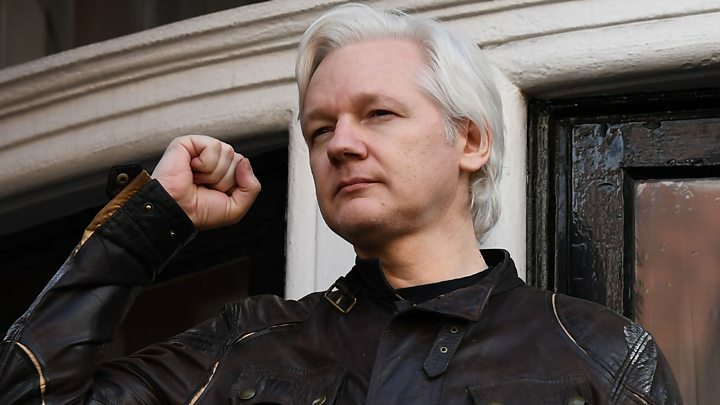 Australian-born Assange, 47, sought refuge in the Knightsbridge embassy seven years ago, to avoid extradition to Sweden over a sexual assault case that has since been dropped. But Ecuador abruptly withdrew its asylum and invited the police to arrest Assange on Thursday. After his dramatic arrest, he was taken to Westminster Magistrates’ Court and found guilty of a British charge of breaching bail. He spent Thursday night in custody and is facing up to 12 months in prison for that conviction. The Swedish authorities are now considering whether to reopen an investigation into the allegations of sexual assault, which Assange denies. The US government has also charged him with allegations of conspiracy to break into a computer, relating to a massive leak of classified US government documents. The UK will decide whether to extradite Assange, and if he was convicted, he could face up to five years in jail. In a tweet, Mr Corbyn shared a video said to be of Pentagon footage – which had been released by Wikileaks – of a 2007 air strike which implicated US military in the killing of civilians and two journalists. The BBC’s diplomatic correspondent James Landale said backing Assange is not without political risk and will not find universal favour among Labour MPs – but Mr Corbyn’s intervention “means the battle over Assange’s future will now be as much political as it is legal”. The editor of Wikileaks, Kristinn Hrafnsson, has expressed fears that the US could file more serious charges against Assange, and that if he was convicted he could be behind bars for “decades”. Mr Hrafnsson added that Assange had been thrown “overboard” by Ecuador – and the country was “horrible” to treat him like that. Meanwhile in Ecuador, President Lenin Moreno criticised Assange, claiming that after spending seven years in the country’s embassy he had dismissed Ecuador by describing it as an insignificant country. Ecuador’s ambassador to the UK, Jaime Marchan, also previously said Assange had been “continually a problem” while he was living in the embassy. Meanwhile, a man who is alleged to have links with Assange has been arrested while trying to leave Ecuador, the country’s officials said. The man – who has been identified by supporters as a Swedish software developer called Ola Bini – had been trying to board a flight to Japan. He’s been in Ecuador’s embassy for seven years – but why was Julian Assange there in the first place? 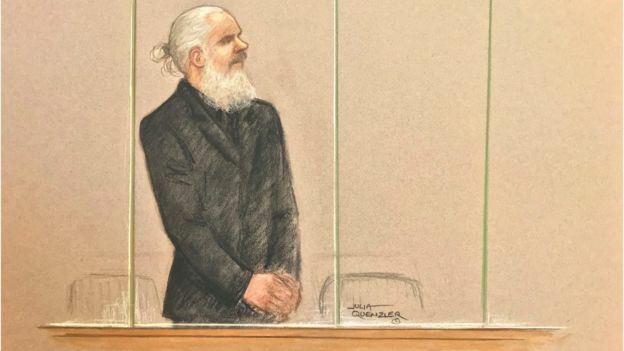 Assange is due to face a hearing over his possible extradition to the US on 2 May. 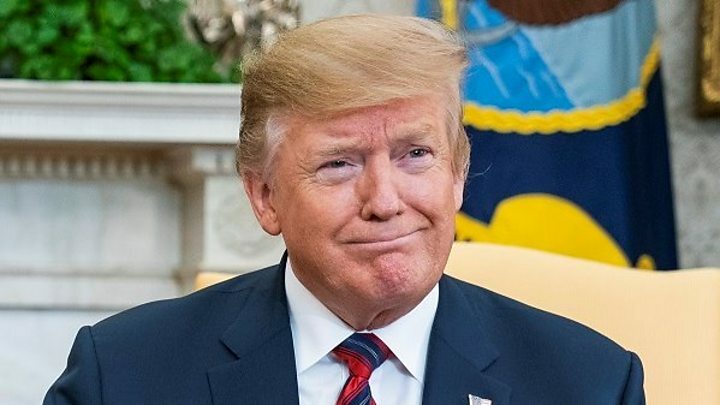 During a briefing at the White House following Assange’s arrest, US President Donald Trump was asked by reporters if he stood by remarks that he made during his election campaign when he said he loved Wikileaks. 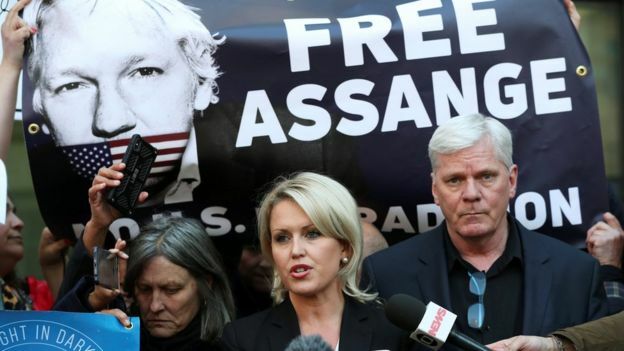 Assange’s lawyer, Jennifer Robinson, said they would be fighting the extradition request. She said it set a “dangerous precedent” where any journalist could face US charges for “publishing truthful information about the United States”. 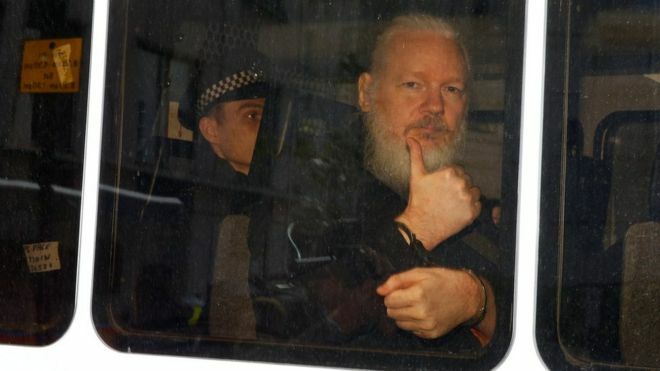 Assange had predicted that he would face extradition to the US if he left the embassy. Meanwhile, Australia said it had received a request for consular assistance after Assange was taken from the embassy. Australian Prime Minister Scott Morrison said Assange will not get “special treatment” and will have to “make his way through whatever comes his way in terms of the justice system”. Foreign Secretary Jeremy Hunt said the arrest was the result of “years of careful diplomacy” and that it was “not acceptable” for someone to “escape facing justice”. Assange set up Wikileaks in 2006 with the aim of obtaining and publishing confidential documents and images. The organisation hit the headlines four years later when it released footage of US soldiers killing civilians from a helicopter in Iraq. Former US intelligence analyst Chelsea Manning was arrested in 2010 for disclosing more than 700,000 confidential documents, videos and diplomatic cables to the anti-secrecy website. She said she only did so to spark debates about foreign policy, but US officials said the leak put lives at risk. She was found guilty by a court martial in 2013 of charges including espionage. However, her jail sentence was later commuted. Manning was recently jailed for refusing to testify before an investigation into Wikileaks’ role in revealing the secret files.